Fresh and sea water, condensate, oils, chemical and petrochemical products. Shipbuilding industry, heating plants, air conditioning system, aqueducts, effluent treatment plants, fire fighting, petrochemical plants. 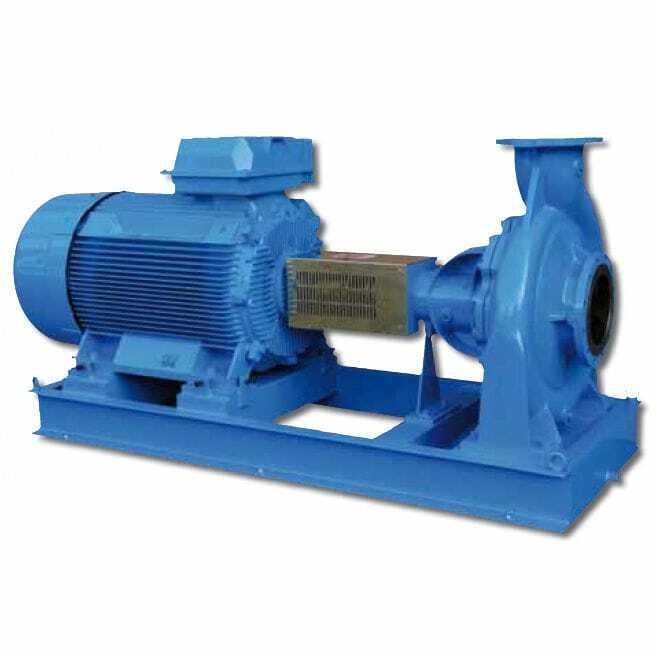 Pump: centrifugal type, end-suction single volute casing, single flow and axial inlet. Impeller: high efficiency, close type, statically and dynamically balanced. Low axial thrust thanks to impeller provided with balancing holes. Mounting system: shaft supported by radial and thrust type bearings placed in an oil bath bracket or, upon request, by self lubricated or grease lubricated ball bearings. The bracket is usually made of cast-iron, bronze or stainless steel for special executions (non magnetic pumps). Seal: single mechanical seal to DIN 24960. Special mechanical seal or cartridge type for specific application or aggressive liquids. Possibility to install soft-packing with external flushing. For temperature higher than 120°C, it is possible to fit the pump with a cooling chamber.